Omaze, the online platform that offers anyone the opportunity to enter to win once-in-a-lifetime experiences with celebrities, athletes, and the world’s greatest thinkers, all to benefit social causes, has partnered with NFL Philadelphia Eagles star Malcolm Jenkins and his charity, The Malcolm Jenkins Foundation to offer a dream football experience to one winner for donations that begin at just $10. The Omaze experience will fly one winner and his or her guest of choice to Philadelphia to join with the Super Bowl Champion. 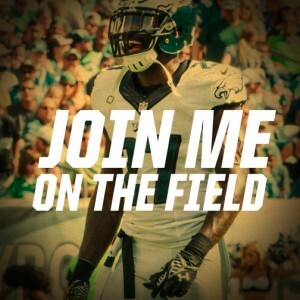 The winner will receive 2 VIP sideline passes to join Jenkins on the field before taking prime seats to watch the Philadelphia Eagles vs. Dallas Cowboys Sunday Night Football showdown on December 14, 2014. The winner will also receive two Philadelphia Eagles #27 Elite jerseys and one night in a beautiful 4-star hotel. The Omaze process works similar to a charity raffle. The user-friendly site allows anyone to enter to win an Omaze experience of his or her choice by donating just $10. Once the deadline to enter for the experience passes, Omaze collects all the entries and selects the winners through a third party computer-generated random selection process. The proceeds are delivered to benefit a specific social cause, in this case, The Malcolm Jenkins Foundation. For more information visit: www.omaze.com/eagles.